The grey rock was actually more organized before I stepped on it. Unbelievable. I don’t know how long you’d have to brainstorm to find a better name for a ship, but it would be a long, long time. A stunningly beautiful house built in a stunningly beautiful spot. The house makes the land better. You don’t see that often enough. At Caleta San Juanico. How the soup is made. Cookstove upper left, ingredients lower right. Pictures of Manta Rays. Sorry they’re not better. A very large sting ray laying on our anchor chain. They’re like cats. Two Reasons Rocks Are Round. The first reason that rocks are round is erosion. If you bang a spiky thing against another spiky thing, the spikes break off first. If you rub a rough thing against another rough thing, they both get smoother. This is the only reason I ever considered, round-rock-wise. The second reason rocks are round is much, much more interesting. If you have a big huge piece of molten rock and you let it cool, it will cool unevenly. The molten rock is more like chocolate chip cookie dough than whipped cream, and some parts will solidify before other parts. Sooner than you’d think, you’ll have suddenly solid parts surrounding still liquid parts. The still liquid parts will get rounder and rounder as they cool and harden from the outside in. In addition, whatever cools first will be more messy and mixed-up, and will probably be weaker than the last parts to cool. 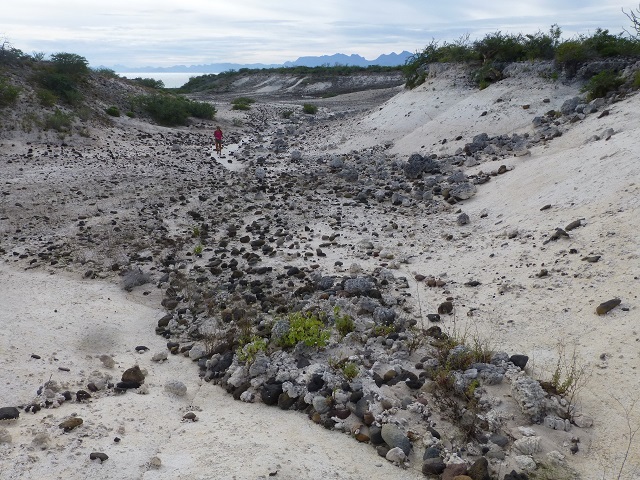 So, when the huge piece of rock finishes cooling, it will begin to break where it cooled first, and break last where it cooled last, leaving round rocks surrounded by egg-shell rocks that quickly break into flat rocks that quickly break into sand and small rocks. Once you see it, you see it everywhere. It was cold and windy so we decided to explore the dirt part of Baja. 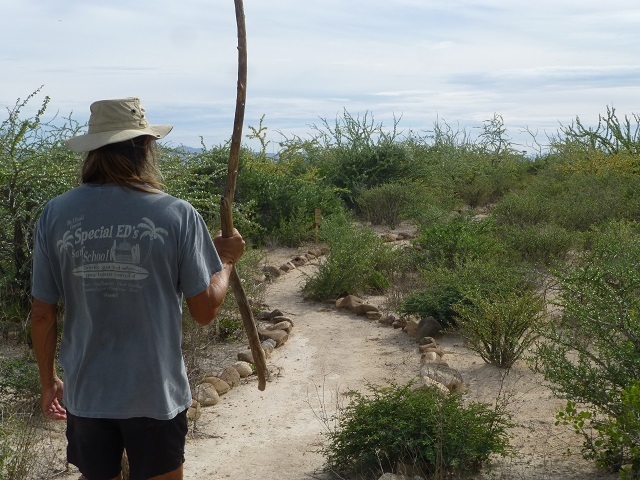 The first thing you need to walk around Baja is a stick. You wave it around in front of you like an idiot. Otherwise you walk into one of these huge face-eating spiders. 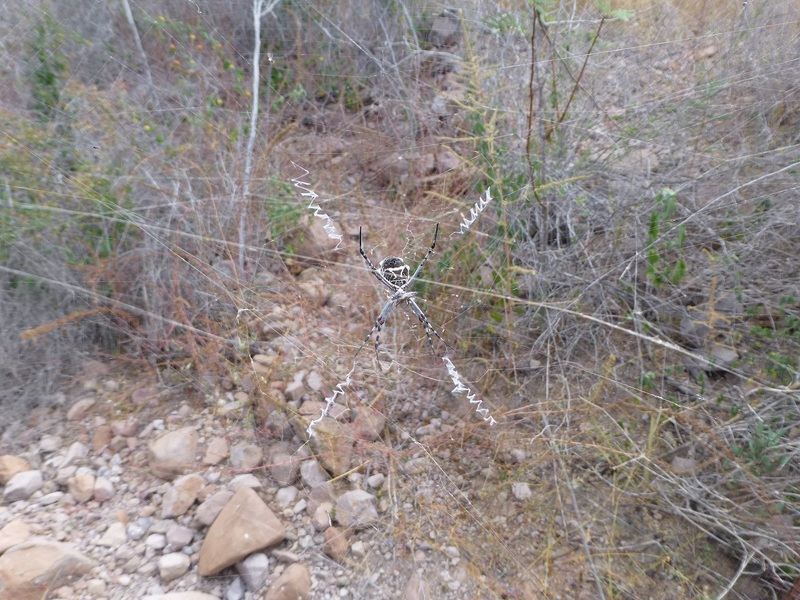 The spiders are pretty easy to see, but you’re busy looking for scorpions and rattlesnakes and tarantulas so it’s easy to overlook the spiders. 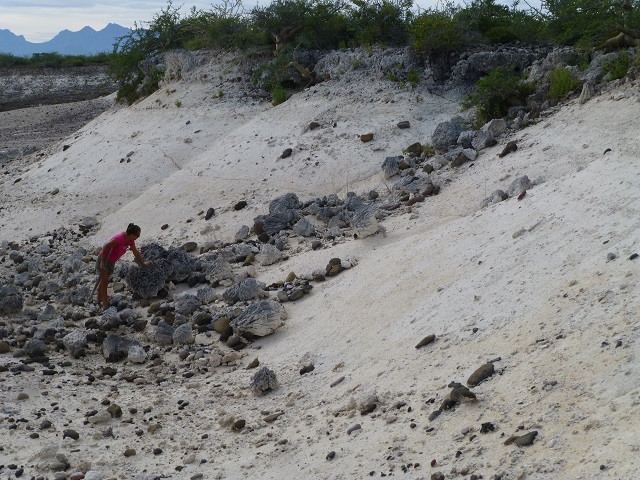 After climbing over a difficult section of beach, we found this huge arroyo just past the dunes. This is about a fifth of it. Huge. You can see the old coral reef just under the now dirt and shrubbery. 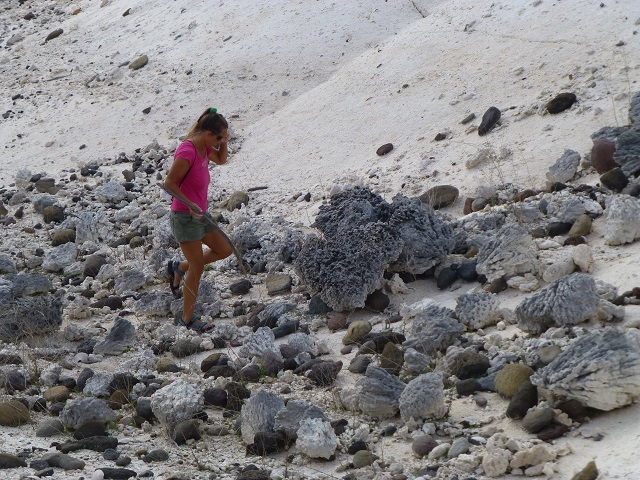 Water has eroded the old sea-bed under the coral. It’s difficult to get a feel for the scale. 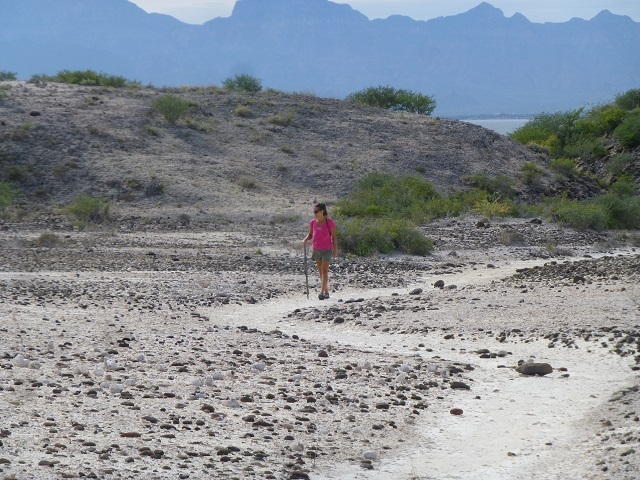 Obviously, this part of Baja was only a tropical coral sea for a short time – just long enough to grow one thin layer of coral. 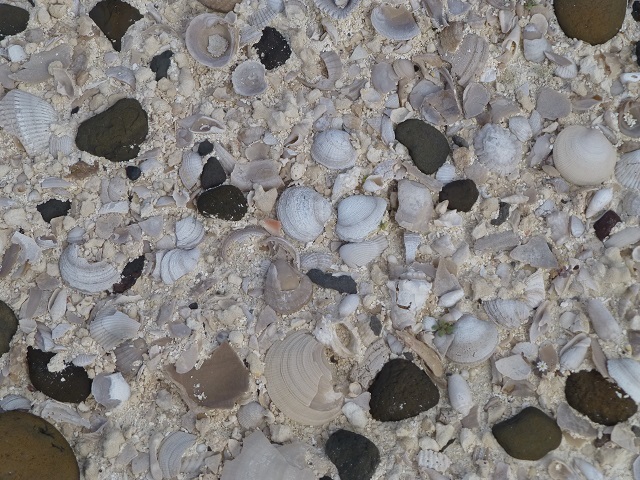 The layer under the coral has shells very similar to modern Baja. It’s like the local climate was cool, then warm, then cool again. Weird. It’s possible that cold ocean currents were cut off, then re-instated again. Dunno. 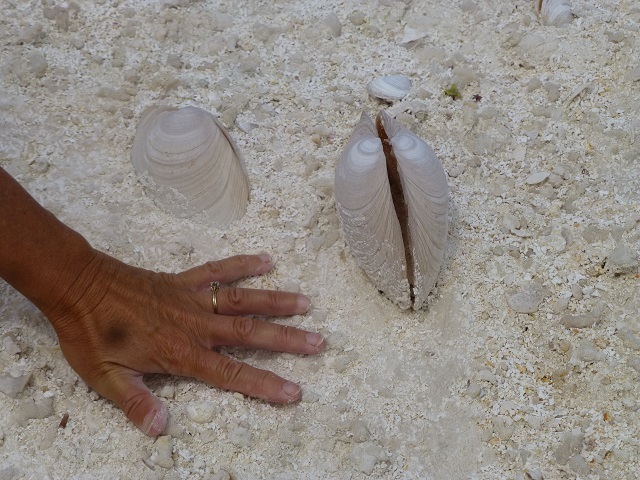 Big shells in places, just like the modern Chocolates. It turned out to be a pretty day. We never saw any bugs but were covered with bites when we got back. Now we know. DEET, baby. That’s the key.